In the springtime, the warmer weather invites me to do more plein air painting, and to visit areas where the trees and flowers are bursting with life. 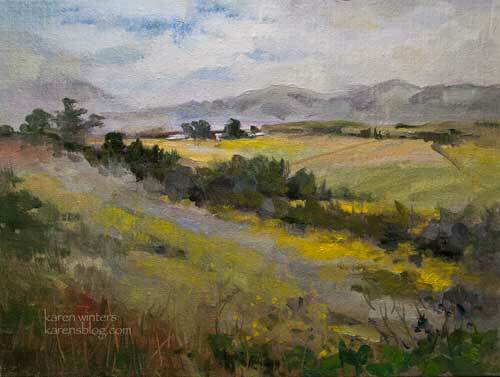 And nowhere is that more apparent than in California’s Central Coast, in San Luis Obispo County. 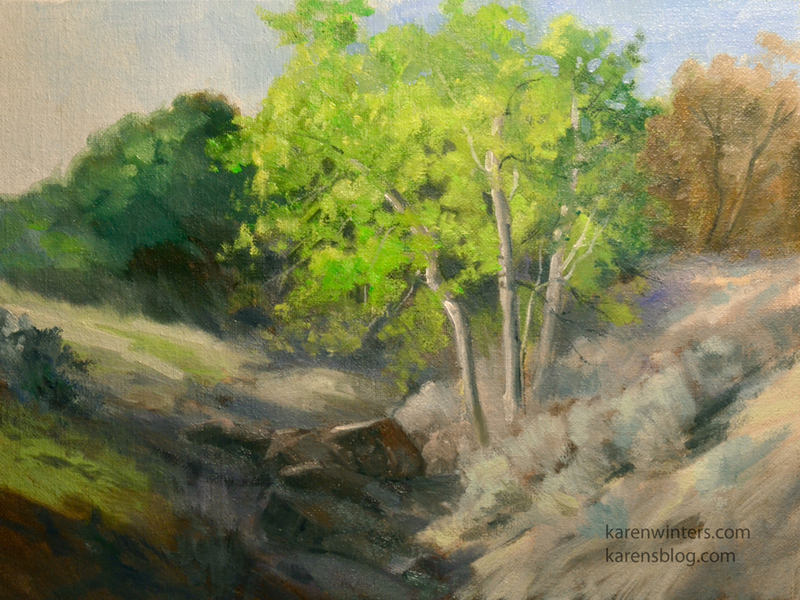 These sycamores were growing in a little clump on the side of a hill, with last year’s sage at their feet. It was late in the day, and within a half an hour the trees were starting to be covered with shadows. 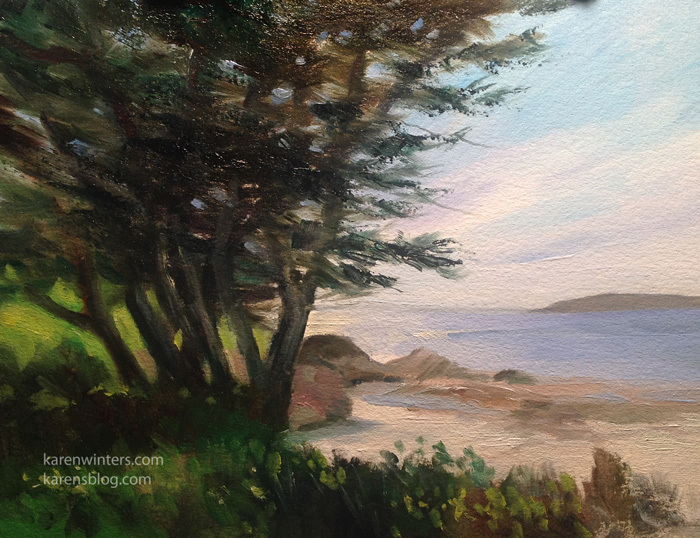 This miniature oil painting of a cypress tree growing by Carmel Bay was inspired by a visit last year. Cypresses always look sculptural to me as their form reflects the action of the local winds. The petite size fits perfectly into a miniature collection. 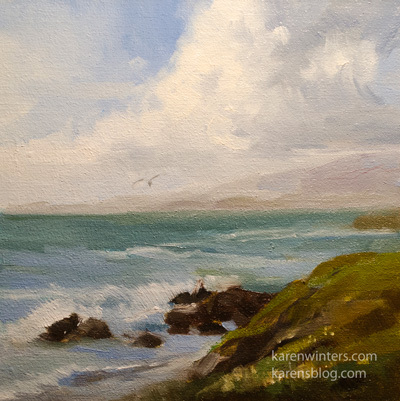 Moonstone Beach in Cambria is one of my favorite shores to paint. This miniature 6 x 6 inch painting captures the freshness of the surf, with the mist in the air, on a beautiful fall day. The area around Paso Robles is one of my favorite California locations – from the vineyards to the ranches to the oak covered hills. This new painting is from the area near Lake Nacimiento/Jolon. 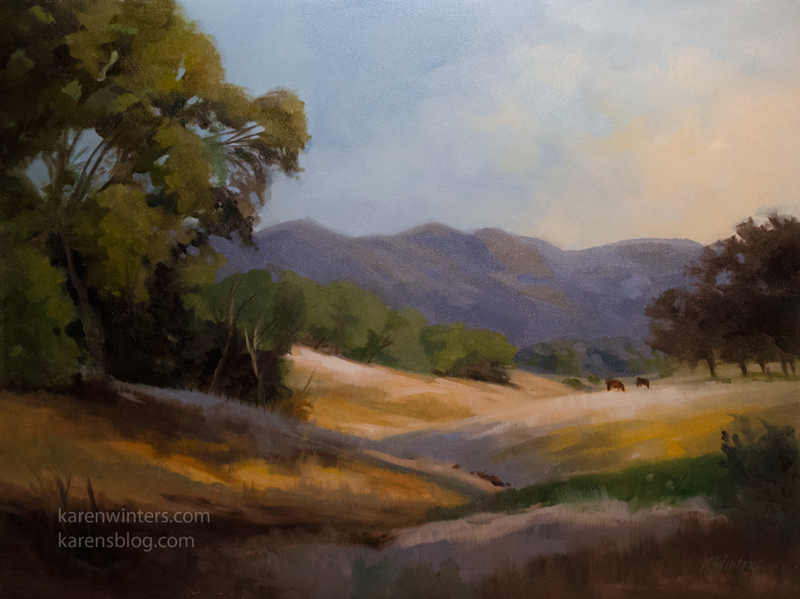 I think scenes like this look best in the late afternoon or in the early morning, when colors are their richest. This painting is a larger studio version of a smaller study I did last year. 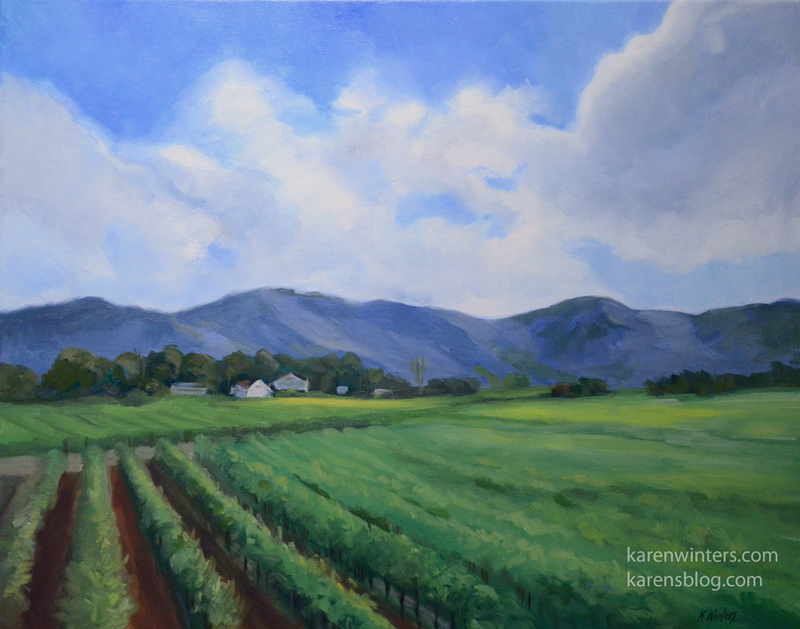 I had been wanting to paint the same subject larger, and just needed the time to get around to it. 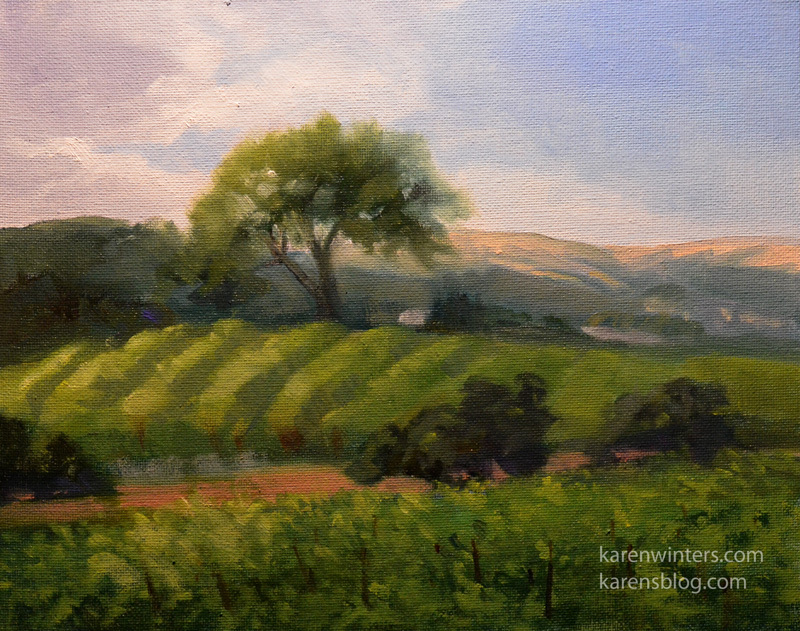 This beautiful vineyard is on highway 46, in Paso Robles. At sunset the hills just glow. I can’t say for sure that these are sauvignon vines, but I liked the alliteration, so there it is. 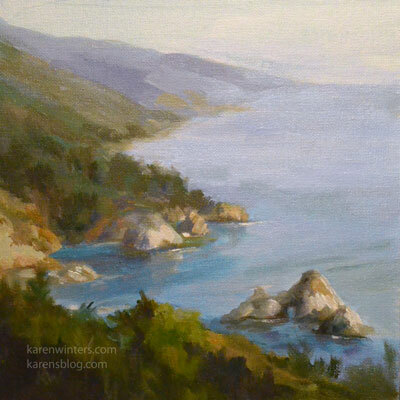 To pin this painting, hover your mouse over the photo. 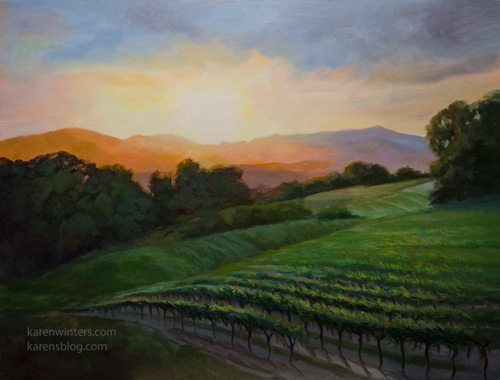 In the early fall, the vineyards of the Edna Valley, in San Luis Obispo County, are heavy with fruit. Days are filled with blue skies and white puffy clouds racing across the sky. 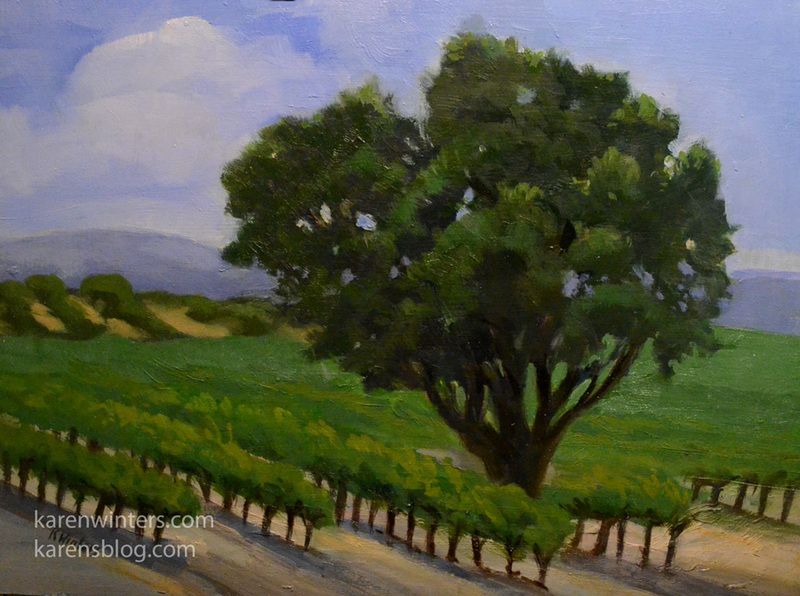 A sunny day and an old oak tree reigns over a peaceful vineyard scene, from California’s rich wine country. This plein air style painting invites the viewer to linger and hear the birdsong as the breeze ruffles the ripening vines. Fresh from last week’s trip to California’s Central Coast, this oil painting features one of California’s indigenous live oak trees towering over rolling vineyard hills. The vines are all leafed out, now, and look beautiful in the late afternoon light. This is a scene I’ve enjoyed painting before, and will no doubt return to again. The location captures the majesty of the Big Sur coastline, along with the serenity of the water at a quiet moment. This is a little south of the Monterey Peninsula.